Snam’s business, following the trends in the energy scenario, will continue to evolve with a strategic focus on providing the energy that the market demands, safely and at a fair cost, whilst contributing to strengthening the centrality of the gas system in the European and Italian energy scenario. 2017-2021: Snam will invest to develop and integrate the gas system infrastructure. To achieve these objectives, the update of the Snam 2017-2021 strategic plan confirms total investments of around €5.2 billion over the plan period. In Italy, Snam will continue to invest in the strengthening and expansion of the national network, which includes the Sardinian methanisation project, and to complete the reverse flow projects that allow its integration with the continental markets along the North-South and East-West corridor, creating a bidirectional gas flow at the national borders in the Gries Pass and Tarvisio respectively. In conjunction with institutional stakeholders and interested operators, it shall also contribute to the evolution of the “gas product” through the expansion of liquefied natural gas (LNG) and compressed natural gas (CNG) infrastructure for the maritime and highway transport sectors, and the conversion of biogas into biomethane to be introduced into the transportation network. Looking ahead, Snam is also devoted to the development of market services, relying on the new Global Solution business unit to globally promote the heritage of distinctive experiences, skills and know-how, which the company has developed in its 75 years of business and management of the entire gas infrastructure chain, in Italy and Europe. 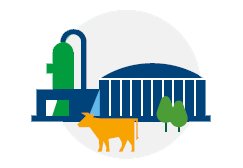 Biomethane uses existing gas networks and also generates positive effects on the agri-food sector, promoting an economic model based on sustainability and circularity in the use of resources. In June 2017, the first gas injection was made into the national network. During the year, Snam made 13 new connections and received numerous expressions of interest with over 500 requests. The compressed natural gas (CNG) used for the automotive sector can significantly reduce carbon dioxide emissions, whilst nearly eliminating emissions of nitrogen and fine particles. In December 2017, was signed agreement for the design, construction and maintenance by Snam of a first batch of 16 new compressed natural gas plants (compressed natural gas – CNG) to which are added a further 3 plants contracted in January 2018. 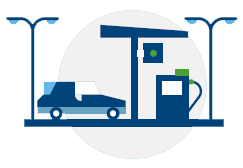 Snam’s goal is to contribute to the realisation of CNG and L-CNG (liquefied-compressed natural gas) stations nationwide, ensuring a more balanced spread throughout the country’s regions and improving the quality of the service provided to users. With the new “Network Balancing Code” regime, which has been in effect since October 2016, the balancing service is conducted in accordance with common and harmonised European rules, which are aimed at promoting trading and market liquidity. In a new system, users are the primary parties responsible for system equilibrium and they can balance their own trading positions (injections and withdrawals from the system) through an hourly reprogramming of their own requirements, and/or by executing gas transactions on both the organised and over-the-counter markets. Snam also performs the role of Default Transportation Supplier, namely supplies gas to Sales Companies and Final Customers for which the Balancing User responsible for the related withdrawals is not identifiable. The same service is also performed for Sales Companies and Final Customers on third-party carrier networks who have expressly requested them. The service in the 2016-2017 thermal year involved 108 parties amongst Final Customers and Sales Companies, for a total volume of approximately 42,743.9 MWh. In 2017, Snam introduced greater flexibility in offering transport capacity at the re-delivery points that power the thermoelectric plants and the withdrawal areas through the provision of short-term capacity products (daily and monthly). For the second year in 2017, Snam offered a service for the integrated allocation of regasification and storage capacity. Following the recovery of regasification activities of the GNL Italia plant, this capacity was increased by one third over 2016 to 1.5 billion cubic meters for the thermal year 2017-2018. The cost of transport, distribution and metering (meter reading) services, which allow the delivery of gas to end users, is one of the three main items of the gas bill. On the basis of data published quarterly by ARERA, the impact of gas system infrastructure services (“Cost of transportation and meter management”) in 2017 was approximately 18% of the total cost for a typical household customer (family with individual heating system and annual consumption of 1,400 standard cubic metres), which translates to a cost of €0.13 per standard cubic metre (approximately €183 per annum). In 2017, 78 connection contracts were signed for the construction of new delivery/re-delivery points (of which 13 were for biomethane inputs) or the upgrading of existing points, up 73% over 2016. Snam is one of the founders of PRISMA, the international project established to promote the harmonisation of rules for accessing and providing services in implementation of the European Codes, by offering services through a single shared digital platform. 41 European operators active in the transport and storage of gas from 16 countries participate in the development of PRISMA. During 2017, the PRISMA platform recorded a significant activity increase, experiencing a two-fold increase in the number of auctions, which went from 2.5 million in 2016 to 4.5 million in 2017. The number of registered shippers reached 600, up by 50 units compared to 2016. The number of active users and connected network points remain unchanged (2,500 and 1,500). In Italy, the constant and structural decrease in national production entails a strong dependence on foreign gas, which at the end of 2017 could exceed 92% of total demand (source ENEA). Thanks to the interconnection of Snam’s network, Italy is the current European country that can rely on the greatest number of supply sources. 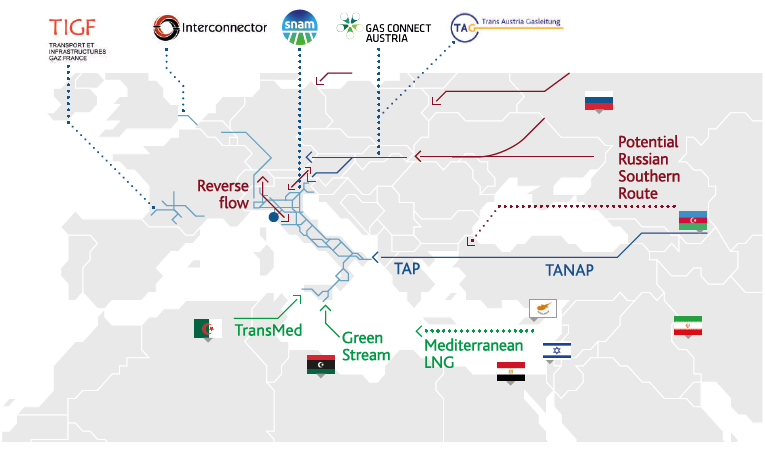 Besides domestic production, the Italian system can receive gas through four methane import pipelines (Algeria, Libya, Russia and Norway) and 3 regasification terminals. It is also planned in the future to add the importation of gas from the Caspian Sea by constructing the TAP methane pipeline. The development of bidirectional capacity in the north of our country along the North-South corridor (reverse flow) may also make Italian supply sources accessible to other European countries. In the instance of Italy, if any of the supply sources should fail, the remaining sources of supply are capable of satisfying more than 120% of the area’s total gas demand, calculated during a day of particularly high gas demand. In 2017 Snam took action to promote the replenishment of national storage facilities for the purpose of being able to manage seasonal peaks in demand. The replenishment level at the end of the injection campaign was 98% as opposed to a European average of 89%. Gas in its various forms guarantees lower carbon dioxide emissions, by 25% to 40% compared to other fossil fuels, as well as reduced nitrogen oxides and fine particle levels. For 2017, ENEA expects, on the basis of the data for the third quarter, a return to the historical highs of the weight of gas on total primary energy (with an estimated share of 38%), thanks to the combined effect of the lower contribution from hydroelectric energy, due to unfavorable weather conditions, the downward trend in consumption of solid fuels and oil, and the consequent significant increase in consumption and imports of natural gas.